My knees say "Thank You, Thank You, Thank You!" If you could “bottle enthusiasm”, you’d see a picture of Dawn. She is one of our truly wonderful customers. Dawn is a professional singer and entertainer, having danced and performed on stage for nearly 30 years. She owns and manages a tribute group featuring Big Band music of the 1940’s and an energetic Golden Oldies show with Rock & Roll hits of the 50’s and 60’s. Watch and listen as Dawn tells it like it is – how she followed our dietary recommendations and used our formulas to reverse chronic knee pain that was limiting her ability to move on stage, rejuvenate a sluggish thyroid of 13 years, and lower her cholesterol from 353 to 210 in just 10 weeks. Be forewarned – put on your seat belt on before you click the video play button below. Dawn is pure, unadulterated energy. What a story! All this can happen for you too, if you want it bad enough like Dawn did. While our formulas played their part, it all came together because of Dawn’s passion, enthusiasm and zest for life. I believe this is truly what ignited the healing force within her. That is the magic of Contagious Health. P.S. The formulas Dawn used are Structural Lubrication with Celadrin, Thyroid Energy and Cholesteine. Click on the links or the pictures below to learn more about each specific formula. We also suggest using the search box in the upper right to find additional articles and customer’s stories about these products. Forks Over Knives in Theaters Now! Last fall we were invited to a pre-screening of “Forks Over Knives”, a documentary film that I guarantee will change forever how you think about the food that goes into your mouth. The movie is opening now in theaters nationwide. Go to the Forks Over Knives website to find a theater in your city and take a friend with you. P.S. Forward this article to your friends and family across the country and urge them to get out and see the movie. You might just save their life! Get "Chinese Skinny" with Fast Start! – 40% of American adults have “Pre-Diabetes”. – 80% with Type 2 Diabetes are overweight or obese. – Blacks have a 51% higher propensity for obesity. – Hispanics have 21% higher propensity for obesity. – The Appalachia Region and Southeast have the highest rates of obesity & diabetes. Why are the Chinese always so skinny? Americans look like blobs compared to them. A staggering 67% are overweight and even worse, 33% of us are “obese”! And it’s getting worse, by the day. Want the lowdown on the Chinese’ big secret? We have it – all natural of course – and it’s the biggest diet news in the decade. If you ever go to China, mark my words, you’ll never see a fat Chinese person. The only fat people you will see are the tourists! The Chinese are always moving. They are running here or there, on a bike or on a rickshaw and have inexhaustible stores of pure dynamite energy. They never sit down for even a second. They even eat on the run! The entire country is ONE BIG PERPETUAL MOTION MACHINE. Being there is like being trapped in a Jackie Chan movie that won’t stop! It’s the GREEN TEA, Stupid! The answer to their epidemic of skinny-ness was staring me right in the face! Apart from running everywhere at a 100mph, all Chinese drink copious amounts of Green Tea every minute of the day. 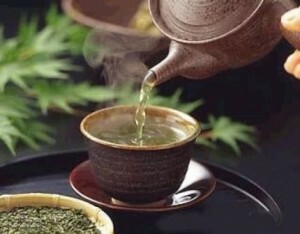 Every business meeting starts with a big teapot full of Green Tea placed in the center of the table. Just go to your local Chinatown and eat at a good, family-run restaurant. A pot of hot Green Tea will be plonked down in seconds. They can’t help it, It’s in their DNA. “In the daily clamor of constantly-breaking news, events and disasters, it’s easy to quickly forget the terrible events in Japan just a month ago. Apart from the heart-breaking, immediate loss of so many innocent lives, the long-term Holocaust of the leaking radiation has not been explained or considered. That is, until today. A countrywoman of mine, Dr Helen Caldicott, has written a piercingly accurate summation of the implications and dangers of ANY level of radiation poisoning.